Next Post: Dirty Laundry or Awfully Sweet Cupcakes? Great! I don’t plan to burn it! Thanks again for your help. I have another question concerning these fragrant tree ornaments. I also think I would like to make them as closet deodorizers (maybe the Cedarwood Essential Oil would help keep the moths away.) I would like to make them in a green color. Would you recommend using Bramble Berry’s Green Chrome Oxide or do you have another green colorant that you would recommend? Thanks again for all your help. Thank you, Anne-Marie, for all your help. Courtney, what soap queen tv video should I watch that will show infusing the annatto seeds in oil? Also, I noticed that Bramble Berry doesn’t carry Cedarwood Essential Oil or Fir Needle Essential Oil anymore. What should I substitute? I know it is July but I am already planning way ahead for Christmas – and this project. I am a little confused as to the Annatto Seeds. Should they be infused in the Fir Needle Essential Oil and the Cedarwood – or should they be infused in another oil like olive or sweet almond oil? If the latter, how much(sweet almond oil with infused annatto seeds) does one add to the melted beeswax? 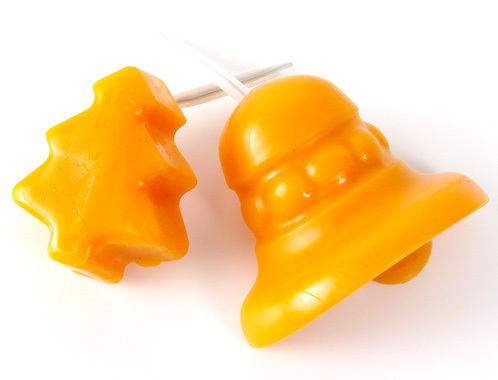 (Also from the photo of the bell mold, it almost looks like the red annatto seed-dyed beeswax is in the middle of the bell and it is surrounded by the yellow beeswax. Is this correct and how does one do that?) Thanks for your help. Sorry we weren’t more clear about that in the tutorial. Watch the video on infusing the annatto in another oil like sweet almond or jojoba. Then you add a little bit of that oil to the wax as colorant. The video will show you how to make a super concentrated colorant so a couple of drops will do the trick. Or add as much as you want until you get the color you’re looking for. The picture with the different color oranges was taken as they were cooling. 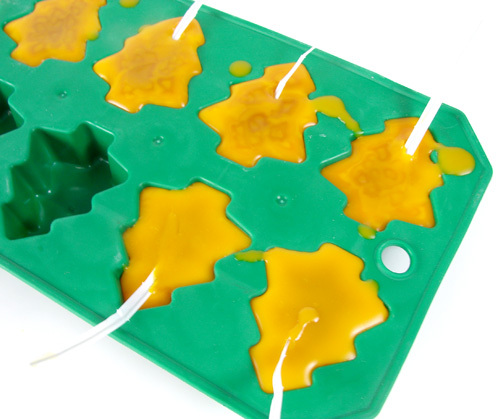 The outside wax has totally cooled…you can still see the warm wax in the middle. Sorry for the confusion. I hope that helps! Interestingly enough, they were designed for ice. But really, what is an ice cube mold if not for soap? 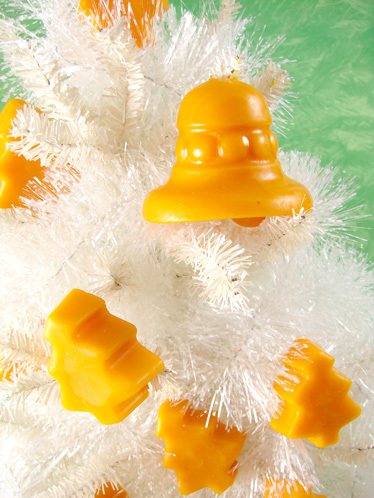 I’ve been looking for those Christmas tree molds to make candy in – I’m assuming they will work for that as well! I love that soaps and candle stuff is often kid friendly. Kids that have their fine motor skills dialed in would be great helpers on this project. Totally – especially if you know someone in a nursing home or someone who can only have a small fake tree. You are brilliant! I so miss the smell of Christmas tree at Christmas time, this is a great idea, thank you. Have a wonderful Christmas Anne-Marie! Can I say genius? This is fabulous! I wonder about a car freshener? Eh. Maybe not. A hot day and you’d come back to a puddle! What a great idea! It would be cool to have my fake tree smell like a real one! These would make cute little gifts, too. Thanks for the tutorial, Anne-Marie! Happy holidays! I love your blog; it’s in my blog reader =)) I did soap ornaments last year. good job easily popping out. Great idea! They would make great gifts also. They look Fab AM. I use Sleighride in mine ( the ornaments I mean!) and it lasts and lasts. The beeswax is easy to unmould too. I have a fake tree at home, the smell of pine is wonderful at this time of the year also with the spices ones. I am doing the same but with my soaps!!! Take a look at my blog!!! Thanks for teaching and sharing your recipes and the joy of the coming baby during this year. PS: I´ll keep you updated on how my school fair, I´m very nervous!!!! Están preciosos y muy originales. Felicitaciones. Oh me too. Man, you guys are making me want to run down to the Bramble Berry warehouse to huff a bag of beeswax …. I love the scent of beeswax too, Debbie. It’s warm and honey-like. Makes me feel all cozy inside! These are adorable, and what fun to make with the kiddos! What a great idea!! 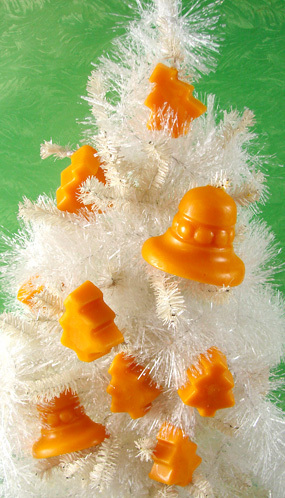 I love the scent of beeswax, too, so I’m sure I would love these ornaments. Awesome tutorial, A-M!